Modified/Sportsman Specs – Fantasy Speedway – " The way life should be. " This division is to be comprised of race cars closely resembling and patterned after both the earliest eras of modified stock cars competing in Maine during the late 1950’s/ early 1960’s, and the first era of full sized full-bodied cars manufactured during the early and mid-fifties. developing 165 to 185 horsepower should be capable of racing competitively within this division. 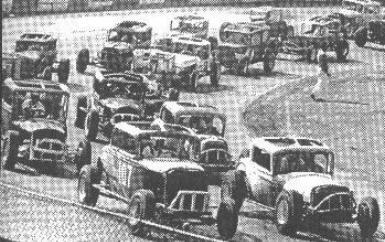 The first era of “Early Late Model” style cars running in our Modified/Sportsman class are full-bodied cars sporting the more sophisticated stock post-war front suspension systems which can be readily adapted to racing on a dirt surface, and which have proven to be able and successful dirt racers. We believe that we can run these later full bodied cars competitively with the modified style cars. (Note: The “Early Late Model” style racecars MAY be considered for their own racing class within Fantasy Speedway, at such time as sufficient cars are available to create a viable racing class). Drivers and owners of all cars running in the Modified/Sportsman division are expected to willingly, thoughtfully, and honestly adhere to, comply with, support, honor, and respect these rules and our concept of equal competition within a given racing division. No race car operating in this division shall be permitted to exceed our accepted performance standard during race events. ANY and ALL race cars presented to Fantasy Speedway as “Modified/Sportsman” class race cars, which in any way exceed or appear to exceed the “norm” for genuine authentic race cars of the target eras SHALL BE RESTRICTED in any fair and reasonable manner so as to equalize the competition within our Modified/Sportsman division, REGARDLESS of whether these race cars APPEAR to comply with the Modified/Sportsman division rules, or not!. Any race car powered by a permitted engine which exceeds the capabilities of the true early era vintage engines (see hp standard) shall be restricted to a level of equal competition. Any owner or driver unwilling to comply with such restrictions as Fantasy Speedway might deem appropriately applied to their race car, shall not be permitted to compete in this division. THE VERY SUCCESS OF FANTASY SPEEDWAY AS A TRUE EARLY ERA RACING PRESERVATION ASSOCIATION DEPENDS UPON MAINTAINING THE AUTHENTICITY OF OUR RACING PRESENTATIONS AND THE CARS WITH WHICH WE DO THOSE PRESENTATIONS, AS ACCURATELY AS POSSIBLE MORE THAN FIFTY YEARS AFTER THE FACT. 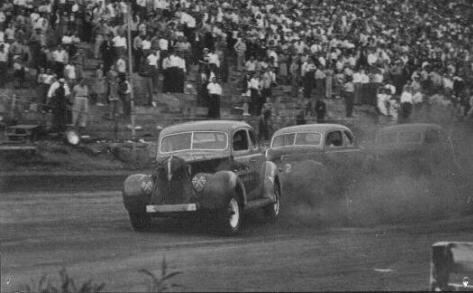 THE MOST ACCURATE REPRESENTATIONS OF MAINE’S EARLY ERA STOCK CARS MUST REMAIN COMPETITIVE AND THE STANDARD BY WHICH ALL ELSE IS MEASURED. 1. Modified style racecars are allowed American design steel or fiberglass bodies through 1948 – coupes, coaches, pickup/panel trucks (also later years of 1948 style pickup/panel bodies). “Early late model” style racecars are full-sized full-bodied cars 1949 thru 1958. Fenders are optional. NO PONY CARS. bodies are allowed on modifieds. “Early Late Model” style bodies must remain stock in configuration and positioning. be covered by sheet metal and securely fastened, or plated over the driver’s position. 1. Car frames through 1948 are allowed under modified style cars, as well as any ½ or ¾ ton pickup frame with solid front axle and leaf springs all around. 1949 – 1958 “Early Late Model” style race cars can use any FULL-SIZE stock frame/chassis built during that era. No “pony car” chassis ! 2. Frame shall be factory production, may be altered up to 10% (modified/relocated crossmembers, etc. ), and shall otherewise retain stock configuration. Reasonable and necessary rust repairs are allowed. Front and rear “clips” are to retain their original stock configuration. No tubular frames of any kind – short pieces of rectangular tubing may be used in frame repair, so long as the basic frame configuration is unchanged. Frame front clips & rear clips may be interchanged between makes to make up a complete frame, so long as such changes are approved by the Board. d. any stock solid front axle assembly w/leaf springs may be substituted in place of an original coil spring suspension. Coil springs cannot be substituted for a solid axle. 1. Any factory production rear axle may be used, so long as stock rear suspension is retained. 2. Open driveshafts may be substituted for enclosed drivelines, and vice versa. with any competitor asking for that information. shall be 165 to 195 hp. 1. Any full race version of those Original Era Jalopy engines permitted in “Jalopy Division” is allowed. a. Dual carburetors are allowed on these engines. 3. Any STOCK OHV V-8 engines up to 351 cubic inches with a single carburetor will be allowed,. The term “stock” is defined as a BASIC engine with all stock ‘run of the mill’ parts – no racing, high output, or performance parts. 4. Significant engine set-back, & minor offset (remaining within stock frame rails), is allowed on Modified style cars. Engine setback is allowed on “Early Late Model” style cars so long as stock firewall remains in stock location. 6. No aftermarket ignition systems, except for those engines listed in 1 and 2 above. # except as modified by racing committee for equalizing.